Exosomes are cell derived extracellular nanovesicles that relay molecular signals pertinent to both normal physiologic and disease processes. The ability to modify and track exosomes in vivo is essential to understanding exosome pathogenesis, and for utilizing exosomes as effective diagnostic and therapeutic nanocarriers to treat diseases. 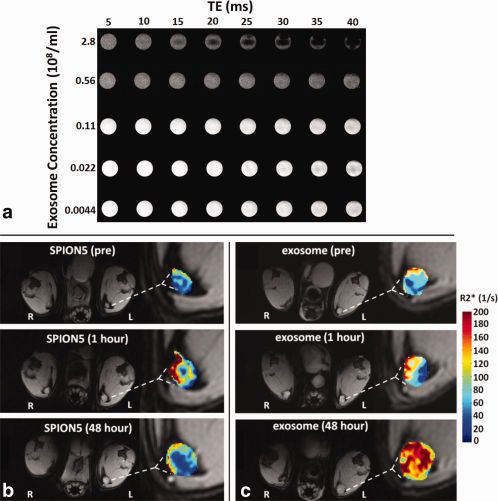 Researchers from the Washington University School of Medicine recently reported a new electroporation method that allow exosomes to be loaded with superparamagnetic iron oxide nanoparticles for magnetic resonance tracking. Building on this approach, they now demonstrate for the first time using a C57BL/6 mouse model that melanoma exosomes can be imaged in vitro, and within lymph nodes in vivo with the use of standard MRI approaches. These findings demonstrate proof of principle that exosome biology can be followed in vivo and pave the way for the development of future diagnostic and therapeutic applications.